About three minute’s walk from Susukino Station in Sapporo, there is a restaurant called Hachikyo. This seafood restaurant is known to serve overflowing bowls of ikura, also known as the salty salmon roe. The restaurant’s menu is packed with different types of seafood but their specialty is the tsukko meshi. However, before you can order that, you would have to agree to the restaurant’s rules! That is, if you leave even one grain of rice on your bowl, you will have to pay a fine. Other than that, before the waiters serve the tsukko meshi, they serve the rice. You are not allowed to eat the rice or push the rice down in the bowl before the tsukko meshi is served on top. Disturbing the rice can lead to your tsukko meshi being revoked! But you don’t have to worry because hardly anyone leaves the dish unfinished! It is a really delicious meal! The owner, Hitoshi Sugita, says that the reason for the fine is not for profit, but to pay respects to the fisherman who provided the tsukko meshi in your bowl. Fishing is a dangerous and potentially deadly profession, so you either pay respects to the fishermen with your stomach or your wallet. After a short while, the waiters begin to serve the tsukko meshi. As they spoon the salmon roe on your rice, they yell out an old sea shanty, “Oi Sa! Oi Sa!”, in which the diners have to yell back. This, combined with the tight, shanty-like atmosphere, kind of makes you feel like you’re getting your food right off the docks. They’ll fill the bowl until the customers says “stop!” or until they can’t add anymore without spilling the salmon roe everywhere. This store is extremely popular and it is very difficult to get a reservation, let alone walk in and sit down for a meal. So be sure to call ahead and put your name on the list! If you do go, be sure to try the “Tsukko Meshi”, which costs about 1890yen and enjoy the experience of the “Oi Sa!” chants! The Sapporo Snow Festival (Sapporo Yuki Matsuri) is held during one week every February in Hokkaido’s capital Sapporo. It is one of Japan’s most popular winter events. The Sapporo Snow Festival was started in 1950, when high school students built a few snow statues in Odori Park. It has since developed into a large, commercialized event, featuring spectacular snow and ice sculptures and attracting more than two million visitors from Japan and across the world. 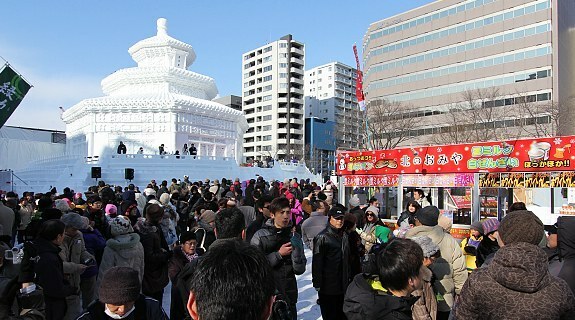 The Snow Festival is staged on three sites: the Odori Site, Susukino Site and Tsu Dome Site. The main site is the Odori Site in Sapporo’s centrally located 1.5 kilometer long Odori Park. 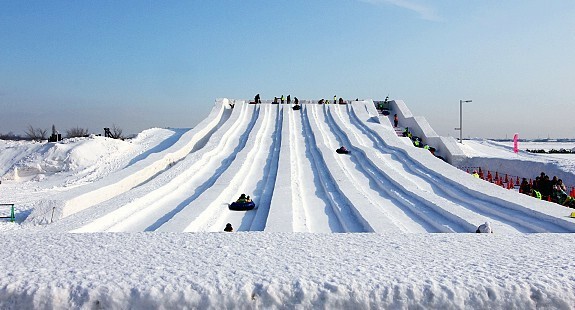 The festival’s famous large snow sculptures, some measuring more than 25 meters wide and 15 meters high, are exhibited there. They are lit up daily until 22:00. Besides about a dozen large snow sculptures, the Odori Site exhibits more than one hundred smaller snow statues and hosts several concerts and events, many of which use the sculptures as their stage. A good view over the Odori Site can be enjoyed from the Sapporo TV Tower at the eastern end of Odori Park. The tower has extended hours (8:30 to 22:30) during the festival. Admission to the top observatory deck costs 720 yen per adult. A 1100 yen ticket allows a day visit and a night visit. 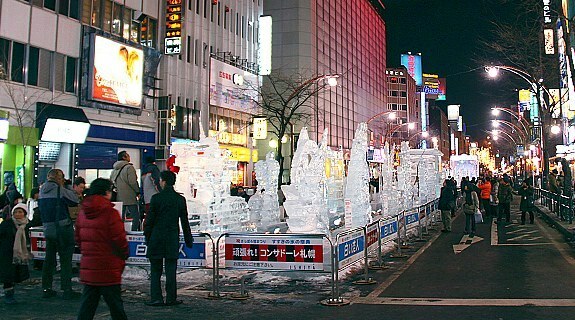 The Susukino Site, located in and named after Sapporo’s largest entertainment district, exhibits about one hundred ice sculptures. Susukino is located only one subway stop south of Odori Park. The ice sculptures are lit up daily until 23:00 (until 22:00 on the festival’s final day). The less centrally located Tsu Dome Site is a family oriented site with three types of snow slides, snow rafting and more snow sculptures. Inside the dome, there are many food stands and a stage for events. The Tsu Dome Site is open daily from 9:00 to 17:00. The Tsu Dome Site remains open one additional week until February 19, 2017. First and foremost, Happy New Year to everyone and may God pour his love and blessings on you! Before we start talking about the Shrine, let’s side-track a bit and talk about how Japan spends their New Year. In Japan, the beginning of the New Year(shogatsu) is marked by several traditions named with the word hatsu, which means “first” in Japanese. Thus, we have hatsumode, which is the first visit to a shrine, hatsuyume, the first dream of the year, and hatsuhinode, the first sunrise of the year. Hatsuhinode comes from a Shinto tradition that says that Toshigami, the kami of the New Year, must be greeted at the first sunrise, and they will bring good luck, well-being and health that you can also keep by using supplements as Keto Slim fo this. Hatsumode festivities are held at practically every shrine and temple across Japan during the first dew days of the year, especially on January 1. At popular shrines and temples you can experience a festive atmosphere with food stands and many people lining up for a prayer at the main hall, purchasing lucky charms for a fortunate new year and disposing their lucky charms of the past year. Most atmospheric is a visit to a temple around midnight on New Year’s eve, when the temple’s bell is rung repeatedly. Back to the main point. The Ise Grand Shrine. Japan’s holiest Shinto shrine. Located in Mie Prefecture, where the sun goddess Amaterasu is enshrined. Officially known simply as Jingū , Ise Jingū is a shrine complex composed of a large number of Shinto shrines centered on two main shrines, Naikū and Gekū. The Inner Shrine, Naikū, is located in the town of Uji-tachi, south of central Ise, and is dedicated to the worship of Amaterasu, where she is believed to dwell. The shrine buildings are made of solid cypress wood and use no nails but instead joined wood. The Outer Shrine, Gekū, is located about six kilometers from Naikū and dedicated to Toyouke-Ōmikami, the god of agriculture, rice harvest and industry. Access to both sites is strictly limited, with the common public not allowed beyond sight of the thatched roofs of the central structures, hidden behind four tall wooden fences. However, tourists are free to roam the forest, including its ornamental walkways. The history of the shrine stretches around 2000 years back. Its founding is recorded in the NihonShoki. The daughter of the Emperor Suinin, Princess Yamatohime-no-mikoto, set out to find a suitable permanent location from which that holds ceremony for the goddess Amaterasu. She wandered the country for almost 20 years where she is said to have heard the voice of Amaterasu saying that the beautiful country of Ise would make a fitting home. Before the shrine’s consecration, Amaterasu was worshipped in the imperial palace. Today, I have something interesting for all of you guys. Firstly, I am very sure you guys have heard or even watched an anime movie that took the world by surprised. Yes, you guessed it well, It’s “Your Name”. “Your Name” currently has earned over 19.5 billion yen ($174 million) and still counting. It even surpassed Hayao Miyazaki’s Princess Monoke which earned 19.3 billion yen($171.4 million) during its theatre run. Putting the anime aside, I am going to talk about the real-life location that was inspired by the anime. One of them is in Hida which is located in the northernmost city in Gifu Prefecture. In the anime, we see female-lead Mitsuha in one of the scene making sake by chewing in her mouth and spitting it out. Yuck, that’s gross right ? Its called “Kuchikami no sake” which translates to “chewing in the mouth sake”. It was a primitive alcohol brewing method. People will chew boiled rice and spit them into a big wooden vat. The chewed rice will be sat to brew for a few days. The eznymes in saliva helped turn starch into glucose, and yeasts living in the air transformed that glucose into alcohol. The practice back then was incorporated into shinto religious festivals. The task will be given to young shrine maidens. It was strongly believed that fermentation was a divine process, and sake had a power on purification. But rest assured, the tradition had died out, probably because of health issues and shrine maidens being creep out. Watanabe Shuzo, a sake brewer based in the town of Hida, has created a variety of sake inspired by the movie. It is called Horai – “Sake of the Sacred Land” which is sold at 3,200 yen(US$31) per bottle. Don’t worry, it was made with modern machinery with proper hygiene and it was even blessed by the priests of Gifu Ketawakamiya Shrine. The town received a huge boost in economy due to pilgrimages. Who said that watching anime couldn’t contribute to society, well now it does. Hida-Furukawa Train Station, which was also inspired by the movie. Today, I’m going to share with you about Geisha or in the Kyoto dialect “Geiko”. Well if you don’t know Geisha who or what Geishas’ are, they are professional or experienced entertainers who attend to guests during meals, banquets and other special occasions. They are well trained in traditional Japanese arts, such as traditional music and dance. Geisha can be found in several cities, including Tokyo and Kanazawa. But the best place to find Geisha’s are in the Kyoto, it remains as the best and the most prestigious place to experience them. And did you know that, some to most of the young girls at the age of 15 start to learn or be taught communication and hospitality skills and various Japanese arts. After lots of training and examination, the talented and most determined ones will go on to become Maiko (apprentice of Geiko/Geisha) and after a few years they can finally become Geisha. There are other various ways to experience Geisha in Japan, the easiest way to see them is to go to Gion in the month of April. At the Miyako Odori(Art Theater) you can watch performances by Maiko and Geiko, from the starting price of 2000 yen to 4000yen. However, a popular service in Kyoto is that Maiko studios to dress as “fake Maikos’ or fake Geishas’ walking around the street. As seen from the picture below. And this picture is an ‘trap’. Fun fact: Did you know that the first Geishas’ were actually MEN!